A town of Maryinka is located near the occupied Donetsk. Despite the formal ceasefire, there are often firings here, and also there are direct hits in residential houses. This is stated in the report of Deutsche Welle. "If I can not change anything in this situation, then I must accept it and move on" - so begins to talk Alina, a resident of Maryinka. 45-year-old woman works in the local Art Center. Once the town had twelve thousand inhabitants, and now, according to her, it is left half of them. The most of people on the streets of Maryinka can be met in the morning and before dinner, even the urban market is open to about 2 p.m., but it depends on the situation at the front. Alina says that for two years there is no gas and normal water supply in the town, and social services work very poor. For eighteen months of active hostilities people are still not used to the fact that there is a large number of military men in the town. As military men tell, the attitude towards them is very different - from requests for assistance in the economy up to failure to sell the products in the stores. "There are different people, but most of them hails when meet us in the town. Sometimes after fights you can see women in black shawls - their men and brothers fighting on the opposite side. There are local residents who think that we forced them to live in such a way. But we just protect these people and the land from the enemy "- says an Ukrainian military whose brigade is located in Maryinka. The distance between the positions of the Ukrainian army and militants is very little, sometimes it does not exceed 300 meters.The military men say they see enemy fortifications, sometimes even motion of machines. "With the onset of darkness snipers begin to fire against us. And hostile snipers work even in the daytime. So, our soldier was killed last week during the duty transfer"- says a commander of the platoon where the serviceman has served before his death. The life of military men is very simple. One group is housed in an abandoned old house where they have a small kitchen and several rooms. The army men sleep on the double-decker makeshift bunks, 6-8 people in the room, having twisted clothing instead of pillows. Children's drawings hang on the walls near the table in the kitchen congratulating the fighters, and freshly brewed borsch is ready at the plate. The soldiers say that they have all enough and have become accustomed to such conditions. Although many of them came to serve as a volunteer, the men acknowledge that they yearn for home very much. They are already 8 months on a front line without rotation. Their brigade was formed at the fourth wave of mobilization which term will soon come to an end. There is a TV in one room, but only Russian or separatist channels are working: "Rossiya-1", "Novorossya TV", "Oplot TV", and others. 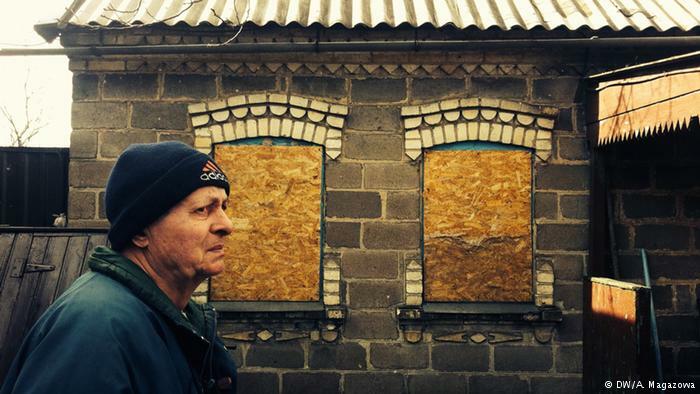 "There is no Ukrainian newspapers or television here. If you had not been here, you would have believed in all that they say, - said a fighter from Kiev. - We have to watch their films and they show a continuous war. I came from the fire fight, and the same is on TV. " Since mid-February, combat operations by Maryinka were intensified, and a six-hour battle took place on February, 18. The military already stopped joking about the truce, but say they do not use weapons prohibited by the Minsk Agreement even when open the fire. "We have orders to observe and report on the situation. You can heroically serve year on the front lines, but by making one wrong shot, you immediately become a criminal ", - says a fighter during a guard service time at the observation post. "Look, what we gave from volunteers on February, 14 - the platoon commander pulls a big box with cookies in the shape of hearts - Help yourself!" It does not feel that the morale of the soldiers fell, only a great weariness. "We are already all here with the broken mentality. I want to forget it all like a bad dream. However, I understand why I'm here", - says quietly a fighter mobilized from the Western Ukraine.